Dog grooming appears to be a booming business in Ireland. While we humans might love a day at the spa or salon, our dogs don’t share those feelings. It’s also not always easy to understand what your dog needs. That makes it easy for us to ignore their grooming needs until things reach the tipping point. Different dogs need different approaches to their personal hygiene. Largely that is down to what breed or type of dog they are, but there’s more to it than that. One Labrador might need far more frequent baths than another Labrador. So how can a responsible dog owner decide on an appropriate grooming routine? Here are some pointers to help you understand what your individual dog needs. If you asked your dog how often he needs a bath, he’d probably say never. But most dogs do need regular bathing. How often ‘regular’ is depends on the type of coat the dog has and how he spends his days. 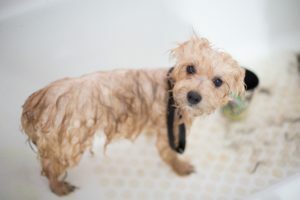 Short hair breeds generally need fewer baths because you can easily wipe muck off of them, whereas dogs with longer coats will need more baths to get clean. Dogs that spend a lot of time outside need baths more often than those who pass their days snoozing on the sofa. And no, a swim in the lake does not count as a bath! 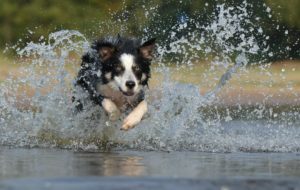 In fact, swimming means your dog needs more frequent baths. Unless your vet recommends more frequent baths, washing your dog every three or four months is good. Short haired dogs that are mostly inside might only need a bath once or twice a year. The ideal frequency is to bathe your dog right before he starts to smell, so when you bathe him, track how long it is until he starts to get a bit whiffy so you know how soon to bathe him next time. One of the most important things to know is that dogs should never use shampoo meant for humans. Our skin has a very different Ph balance than theirs does, and our shampoo can damage their skin. Look for the most gentle, mild dog shampoo you can find, and use it sparingly to avoid irritating your dog’s skin. It’s actually easier to give your dog a shower than a bath. If you have a large enough shower with a hand-held sprayer, that is the best way to wash your dog. A piping hot shower will hurt him, but he doesn’t want an icy cold one either. Use tepid water to keep him comfortable. Remember to brush your dog and remove any matts in his coat before his bath. Between baths, you can keep his coat clean and healthy with daily brushing. Just five minutes a day can keep him fresh, prevent matts and keep the shedding under control. Choose a brush that is appropriate for your dog’s coat. Short hair breeds do well with a soft bristle brush. Double coated breeds will need an under coat rake. Dogs with long silky fur need a brush with bristles that are long enough to reach through their fur but soft enough not to scrape their skin. They might also need a comb. Not all dogs need haircuts. In fact, very few dogs actually need a haircut. But some types of dog do have an easier time and look even more adorable with a nice haircut. Unless you are showing your dog, there are no rules about how their coat should look. The main point of a haircut for a dog is help keep him tidy and avoid matts. Some dogs will need the hair around their eyes and under their ears kept shorter so they get enough air flow to their skin to keep it dry and avoid infections. Dog hair cuts fall into two broad categories. You can get a very functional haircut for your dog to ensure his fur does not drag the ground or obscure his face. This is simply a trim. Or you can go for a cut specific to his breed. Think of poodles and larger terriers here. They traditionally have very distinct haircuts. But you are not obliged to get your dog a traditional cut just because he is a particular breed (unless you wish to show him). It is really down to your own taste. But dog haircuts are not really a DIY job, unless you are doing a very simple tidy-up on a very cooperative dog. Professional groomers can ensure the result you want with a lot less grief and upset. When you are choosing a dog groomer, ask for references from people with a dog similar to your own. Inspect their facilities to make sure it is clean and the dogs there are not unreasonably unhappy. (Some will be miserable because they hate and fear haircuts, but they shouldn’t all look scared.) Make sure the dogs are safely in crates, not free to bother each other or disrupt haircuts.